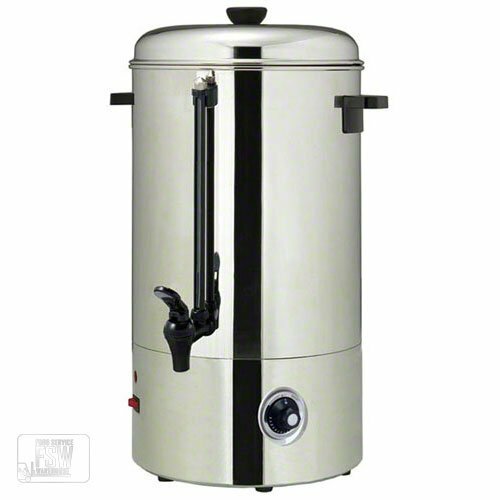 This highly portable and attractive 100 Cup Water Boiler (WB-100) is perfect for caterers, buffets and other operations that need a countertop water boiler for tea, cocoa and other hot beverages. The heat resistant handles and knob make it easy to adjust and move this unit after it's been filled and turned on. When the 100 cup capacity is running low a clear water level gauge can be easily read so that it can be quickly refilled, ensuring that service is never interrupted. If you have any questions about this product by Admiral Craft, contact us by completing and submitting the form below. If you are looking for a specif part number, please include it with your message.